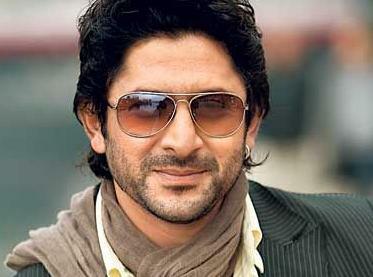 * Arshad Warsi was born on 19th April 1968 in Mumbai. * He attended Barnes School, Deolali, Maharashtra, during his school days he was a national level gymnast. * He was orphaned when he was just 14 years old and he struggled a lot for a livelihood. He started to earn his bread at the age of 17 as a door-to-door salesman for a cosmetic company and later he worked in a photo lab too. * Since he had great interest in dancing he was able to join Akbar Sami’s Dance group in Mumbai and took choreography as a career, he also worked for movies like Thikana in 1987, Kaash in 1987, Roop Ki Rani Choron Ka Raja in 1993 etc. * When he was 21 he won fourth prize in “World Dance championship, London” in 1992, later he started a dance studio called ‘Awesome’. * Arshad Warsi married Actress and Model Maria Goretti in 14th Feb 1999, the couple have a son Zeke Warsi, born in 2004 and a daughter Zene Zoe Warsi born in 2007. * He made his acting debut with ‘Tere Mere Sapne’ in 1996 alongside Chandrachur Singh and Priya Gill, the film did very well at the box office. His subsequent films failed to impress the box office. * His second blockbuster hit was Munnabhai MBBS in 2003 alongside Sanjay Dutt and Gracy Singh, the wenton to become huge commercial hit of the year, he even earned nomination for Filmfare Best Supporting Actor. He later worked for succesful films like Maine Pyaar Kyun Kiya in 2005 alongside Salman Khan, Sushmita Sen and Katrina Kaif, Salaam Namaste in 2005 with Saif Ali Khan and Preity Zinta, Golmaal in 2006 with Ajay Devgan, Kabul Express in 2006 with John Abraham, Lage Raho Munnabhai in 2006 with Sanjay Dutt, Vidya Balan and Boman Irani, Dhamaal in 2007 with Ritesh Deshmukh and Sanjay Dutt, Golmaal Returns in 2008 with Ajay Devgn and Kareena Kapoor. * In 2010 decade he appeared in superhits like Ishqiya in 2010 alongside Vidya Balan and Naseeruddin Shah, Golmaal 3 in 2010 with Ajay Devgn and Kareena Kapoor, F.A.L.T.U in 2011 with Riteish Deshmukh and Jackky Bhagnani, Double Dhamaal in 2011 with Sanjay Dutt and Mallika Sherawat. * He became a film producer through “Hum Tum Aur Ghost” in 2010. * Apart from films he also worked for several Tv shows like “Sabse Favourite Kaun” on STAR Gold, Bigg Boss on Sony, Razzmatazz on Zee TV etc.